Decent pub and not too many bearded trendies. Must be the only pub in London with an upstairs area dedicated to darts 鈥� 6 (count 'em) boards for the budding Jocky Wilsons out there. I chucked a 9 dart 501 when I was last in, ask the landlady if you don't believe me. Does it have a Greek music night, I hear you ask? Popped in Friday lunchtime before Christmas. Plenty of people eating. This is a very darts pub with a board downstaira and a sign saying more boards upstairs, also darts on the TV. Still seemed a friendly place, Harveys Best, 拢3.70. Christmas decorations were very 80's. Could this be a retro pub of the future? It seems to have bucked the trend to move with the times and seems better for it. The inside, which is much larger than the exterior suggests, has comfortable and clean surroundings. Two real ales on sale ,served by a friendly landlady who will tell you about the history of the pub if you are interested .Also has a garden area,which is unusual in London. 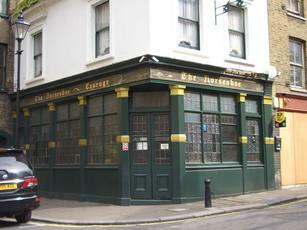 This is a nice little pub hidden away in the backstreets of Clerkenwell. Despite being early on a Friday evening, when most pubs were busy, we practically had the run of this place. Outside, a few drinkers were enjoying the sunshine. Inside, there were a couple of people playing darts. Cornish Coaster & Wandle were the ales on offer. There's plenty of seating available. But if it's not busy on a Friday evening, I wonder if it ever fills up. Nevertheless, a nice find.